There are a few common causes of pink eye, and rarely is a pink eye in a child a cause for concern itself or a sign of a serious underlying problem. Schools and daycares have a ‘no pink eye’ policy simply because it is so contagious to others. Why do children get pink eye? 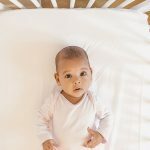 Babies less than one year of age will often have tearing and eye drainage from one or both eyes without any redness of the conjunctiva (the white of the eye). This is caused by a blocked tear duct and will almost always resolve by the time the child is 12 months old. The eye is not pink, so it is not ‘pink eye’. Viral: One or both eyes are pink or red and are draining. Your child may wake up with his/her eyes crusted closed. The drainage is not constantly thick, but alternates between clear drainage and some white discharge. The eyes are not painful but might be mildly itchy or feel uncomfortable. Viral conjunctivitis usually occurs when your child has cold symptoms – cough, congestion, runny nose. Allergy: Both eyes are affected from the first appearance of the pink eye(s). The eyes are very itchy and if there is any drainage, it tends to be clear. 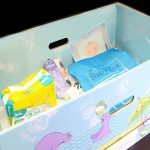 Your child might also have a runny nose, sneezing, itchy nose or throat. Foreign Body: Usually there is a history of having sand or dirt thrown into your child’s face, or into the air before your child begins to complain of his/her eye hurting. This tends to involve only one eye and can lead to a lot of tearing, redness and discomfort. Injury: Often caused by a scratch, so only one eye is involved. The eye may become red, have a lot of tearing, and be painful. Much like a foreign body. Bacteria: One or both eyes are red and there is a constant flow of thick drainage with eye crusting. The skin around the eyes might be swollen or red. What can you do if your child has a pink eye? If you suspect a foreign body you should flush your child’s eye with saline solution. If that is not available, use lukewarm water. Continue flushing until you see no signs of sand or dirt remaining. If your child continues to complain of pain after an hour or two you should contact your child’s pediatrician. If you suspect allergies there are both over the counter and prescription allergy eye drops that can provide relief. You can call your child’s pediatrician during normal office hours to discuss the options available. Antibiotic eye drops are used to treat bacterial conjunctivitis. Viral conjunctivitis will resolve on it’s own. You can contact your child’s pediatrician during normal office hours to discuss the need for drops. When can your child resume school, daycare, playdates? If your child has an eye injury or allergies causing a pink eye there is no reason to keep him/her separated from other children. These causes of pink eye are not contagious. 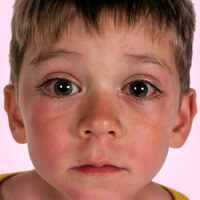 If your child has viral conjunctivitis it is contagious as long as the eye is red. If your child has bacterial conjunctivitis it is contagious until 24-36 hours after antibiotic eye drops have been started. Try to keep your child from touching his/her affected eye. Pink eye is spread by contact. Instruct everyone else in the house to avoid touching their eyes unless they have just washed their hands with soap and water. If your child wears makeup or contact lenses – anything used during an infection will have to be discarded and replaced, so be sure to avoid wearing or sharing makeup and have your child wear glasses instead of contact lenses for the first 3-5 days of treatment. 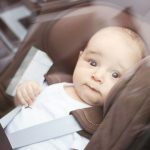 If your child is old enough to cooperate, have him/her look up towards the ceiling, pull out the lower lid a bit, and place 1-2 drops into the well that appears in the lower lid. As your child blinks the medication will reach all areas inside of the eye. If your child is too young to cooperate and keeps his/her eyes closed, place 1-2 drops at the corner of the eye closest to the nose. When your child opens his/her eye the drops will fall into the eye. Wash the eyes/lashes with baby shampoo 1-2 times a day. Hold warm (as warm as can be tolerated) moist compresses on the affected area at least 2-3 times a day. Avoid rubbing or squeezing the stye- this may spread the infection. Hold a warm wet black tea teabag over the affected area for 5-10 minutes at a time to decrease swelling. If your child tends to have recurrent styes, make a habit of washing the eyes/lashes with baby shampoo daily, even when no stye is present, and this can help prevent styes from recurring. If the stye is so large that it is interfering with your child’s vision, or if the skin around the eye becomes red, warm, tender, contact your child’s pediatrician. Is not improving after 5 days of appropriate treatment- bacterial eye drops or allergic eye drops, depending upon the cause. Had an injury and has a red painful eye. Had a foreign body in his/her eye and still has pain 1-2 hours after flushing the eye out. Has vision changes (aside from slight blurring when tearing and discharge are present). Is very sensitive to light and unable to open his/her eye unless the room is darkened. Has red, swollen and/or tender skin around the eye. Has pink eye, is less than two years old, and is not sleeping well or complaining of ear pain. Ear and eye infections in young children often go hand in hand. Just does not seem OK to you. Remember, no one knows your child like you do!